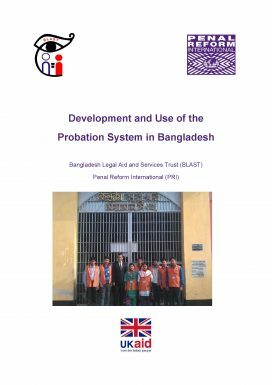 Last year, PRI and our partner organisation Bangladesh Legal Aid and Services Trust (BLAST) conducted research into the development and use of probation in Bangladesh. Findings and recommendations from the research previously formed the basis of discussions at a seminar on increasing the use of probation in Bangladesh held by PRI and BLAST in Dhaka in December, and now inform this report. propose effective policy recommendations and ways of implementing alternatives to imprisonment in Bangladesh, with a particular focus on probation. The report is now being disseminated to officials to promote the use of probation and alternatives to custodial sentences. This publication has been produced with the financial assistance of the UK Government.